I know I mentioned we would talk about customizing the fetch requests, however, I have been working on some code related to the Active Record Fetching project, which I am renaming to MagicalRecord, that is also just as useful as fetching–threading. Whenever most cocoa developers mention threading and Core Data in the same sentence, the reaction I see most often is that of mysticism and disbelief. For one, multithreaded programming in general is hard–hard to design correctly, hard to write correctly, and debugging threads is just asking for trouble. Introducing Core Data into that mix can seem like the straw that broke the camel’s back. However, by following a few simple rules and guidelines, and codifying them into a super simple pattern, one that may be familiar to you, we can achieve safer Core Data threading without the common headaches. First up, I want to thank Matt Long and Marcus Zarra for allowing me to guest post on CIMGF. This post is the first in a short series of topics describing how to I’ve made using Core Data a little simpler without giving up the power features you still need. The full project from which this series is derived is available on github. Core Data, for both iPhone and Mac, is a very powerful framework for persisting your objects out of memory, and into a more permanent storage medium. With the enormous power of Core Data, it can be easy to slip into the trap of thinking that Core Data is very complex. iTunes has a very neat way of searching your library, where it takes each word in your search and tries to find that word in multiple fields.Â For example, you can search for “yesterday beatles” and it will match “yesterday” in the Name field and “beatles” in the Artist field. The basic predicate binding for NSSearchField provided by Interface Builder is not complex enough to archive this kind of search.Â I need to build the predicate dynamically since I can’t assume what field the user is trying to search and that each additional word should filter the list further – just like iTunes.Â Here is how to go about adding iTunes-style searching. Announcement: Marcus’ Core Data Book Just Went Beta! A lot of hard work has gone into this book already and I see it becoming the definitive text on the subject of Core Data. The release date is slated for March 30, 2009, but it’s great to see it in beta. 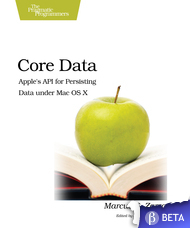 If you want to pick up the beta in PDF, it is available now from Pragmatic here: Core Data: Apple’s API for Persisting Data under Mac OS X. While new Cocoa programmers will find it a great help to getting started quickly with Core Data, the book also covers some really interesting and advanced topics such as data versioning and migration, Spotlight/Quick Look integration, Sync Services, and multi-threading. You can really see Marcus’ command of the subject shine in these chapters which are already available in the beta. Give Marcus some feedback on the book as it progresses. It’s going to be a great reference for any Cocoa Developer looking to harness the power of Core Data. $41.35 for the beta PDF plus hard copy when it’s released in March. Mad props to Marcus. Congratulations! Undo support in Cocoa is fantastic but for those who have tried to mix it with Core Data know that it can be a bit frustrating. Generally, undo support can be ignored in most applications and it will “just work”. But when Core Data is added to the recipe then things get a bit confusing and more complicated.